Timocco's Progress Tool is really the best way to see the efficacy of playing - CEO Eran Arden. Timocco is a supplemental therapeutic activity for children with Cerebral Palsy, ADHD, Developmental Coordination Disorder, Autism, Learning Disabilities and other developmental delays. The 50+ games on Timocco’s platform are designed by child development experts to motivate children to improve motor, cognitive and communication skills. 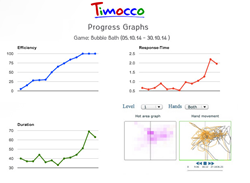 The latest innovation on Timocco’s interactive gaming platform, the Progress Tool monitors how developmental skills are impacted over time as children play. Therapists can use the Progress Tool to track a user’s performance and to show parents developmental progress or to emphasize areas or skills that require extra focus. The Progress Tool tracks a player’s performance over time, monitoring progress across four key skills: bilateral coordination, midline crossing, hand-eye coordination and attention. Timocco’s in-house team of occupational therapists or a child’s therapist can conveniently activate the Progress Tool for a player via the platform’s user-friendly interface. The system uses four games, each designed to operate as an assessment tool for one of the four key skills. Players are requested to play that particular game following every ten minutes of accumulated gameplay. After an assessment, therapists can access data that includes charts illustrating motor efficiency, reaction speed, and play duration. Heat-map charts showing ‘hot areas’ reflect the child’s movements and recorded hand-motion patterns can be played back to view a child’s progress. Timocco’s 50+ fun games for kids with special needs are available online and can be played on a personal computer - only a webcam and two round colored objects are required to play. Timocco was recently awarded a UK patent for its unique object tracking technology that enables a variable range of motion. That technology allows players with a limited range of hand movement, or those in wheelchairs, to configure Timocco’s games to best suit their abilities.